What are Russia’s objectives in Ukraine? Russia’s objectives are multiple and include domestic as well as geopolitical factors, but in my view national security concerns and geopolitical considerations are paramount. Basically, Moscow has drawn a line in the sand against any further expansion of NATO to countries on its borders, above all Ukraine. The Russians have opposed NATO expansion since its inception, but what has changed is that Moscow now has the power to block the accession of Ukraine, or indeed of any other former Soviet republic that is not already a member of the alliance. The Russian political elite is convinced, regardless of what Western officials say, that things like E.U. association agreements are simply first steps toward full incorporation into the Western institutional orbit, including NATO. So Russia’s minimal objective is military neutrality for Ukraine, but it has more ambitious goals as well. I am sure that Putin has no intention of abandoning his plans to establish a “Eurasian Union” that serves as a geopolitical counterweight to the Atlantic Alliance, one of a number of “poles in a multipolar world,” as he puts it. And unless, (and until) he gets his way, he has multiple means at his disposal for making life miserable for Ukrainians, Georgians, and indeed for all of Russia’s neighbors, in the coming months and years. What are Russia’s next moves? I believe that the Kremlin is engaged, at a minimum, in an all-out effort to destabilize Ukraine prior to the May 25 presidential elections, and it is doing so through a “covert war” directed at encouraging regions in the east and south to declare what amounts to “sovereignty” from Kyiv, much as the union republics and autonomous republics of the USSR declared “sovereignty” from Moscow in the late Soviet period. If “sovereignty” morphs into “independence” or union with Russia, so much the better. And the more regions that break away, the better as well. A “Donbas Republic” is not as good as an “East Ukrainian Republic,” which is not as good as a “Novorossiya Republic” that includes all eastern and southern regions extending from Kharkiv oblast through Odesa oblast, which would “rescue” Transnistria from being “blockaded” by a hostile Ukraine. If it does not succeed in creating protectorates in the east, Moscow will nevertheless continue to do everything in its power to keep Kyiv politically weak and as dependent on Russia as possible. Among other measures, it will use its considerable economic leverage, particularly but not only natural gas exports, to undermine the Ukrainian economy and make it as costly as possible for the West to help turn the Ukrainian economy around, thereby keeping Ukraine out of the European Union. But again, if the mobilization of pro-Russian forces in the east and south produces considerable violence, which it very well might, I think Putin will invade. He has more or less said he will, and I think that is what he will do. What would the consequences of a Russian invasion be? If Russia invades, I believe the consequences will be terrible – bad for the United States, very bad for Western Europe, terrible for Russia, and catastrophic for Ukraine. I think there is very little likelihood of a Crimea scenario, whereby Russia would take control of the east and/or south with little bloodshed. It is at least possible, but in my view quite unlikely, that Russia can accomplish its goals in the east using covert means that do not provoke widespread violence. An overt invasion, on the other hand, will certainly mean considerable bloodshed because the Russians will have to destroy Ukrainian military assets – the tanks, artillery, armored personnel carriers, helicopters, fixed winged aircraft, and so on, that are currently deployed in the east and south. And it will also probably launch air, missile, and special operations strikes against Ukrainian military assets in central and western Ukraine. Nor is there any clear line of separation where Russian forces could stop short of the Dnieper River, which will likely make for a dangerous line of contact wherever the Russian military decides to stop. What should Kyiv be doing now to address the uprisings in the east and south? It is imperative that Kyiv does its best to preserve its authority in the east and south without resorting to significant violence. In my view, avoiding violence is more important than restoring Kyiv’s authority in the Donbas or elsewhere in time to hold the May 25 presidential elections – I frankly do not think that is possible at this point in any case. More specifically, I think it will be impossible, at least for the time being, for Kyiv to retake buildings seized by the heavily armed pro-Russian forces in the cities of Luhansk and Donetsk without spilling a great deal of blood. If they are lucky, they may manage to do so in some of the smaller towns and cities, but even that is unclear. So Ukrainian forces should defend themselves and their weapons, but they should not fire on civilians. And Kyiv should refrain from resorting to force to dislodge the militants from government buildings in the east, and in general it should be extremely cautious with its military deployments in the region. Beyond that, Kyiv should do its utmost to contain the uprisings to Donetsk and Luhansk oblasts. For now, pro-Russian forces seem focused on Mariupol, a small city located in the south of Donetsk region along the Sea of Azov, which would be critical if Russia plans to control a land corridor between the Russian border and Crimea. But the bottom line is that Kyiv is going to have to exercise patience, something that the current government will be hard pressed to accomplish given public pressure to take action – including, but not only, pressure from the far right. So far, in my view, the interim government has shown remarkable restraint. Do you think there is a risk of civil war if Ukraine goes ahead with military action in the east and south? I have no doubt that there would be resistance to military action by Kyiv in the Donbas oblasts. What is not clear is how much resistance there would be. Nor is it clear if Ukrainian security forces would obey orders if Kyiv called for a crackdown. What does seem clear is that the Ukrainian military is very reluctant to use force against civilians, which is a good thing, and hopefully they are under orders to be extremely restrained in using lethal force unless they come under attack. But my impression is that there have nevertheless been significant defections, while in other instances Ukrainian soldiers have given up their arms and surrendered. All this suggests divided loyalties and low morale, which is what one would expect with a divided population and a security apparatus that has worked very closely with its Russian counterparts over the years (and that is doubtless deeply penetrated by Russian agents). Still, my guess is that, absent Moscow’s intervention, Kyiv will eventually be able to restore order in the east without provoking a war if its response is moderate, gradual, and proportionate to the threat. All the evidence I have seen suggests that a majority of the people in the east do not want civil war, do not want a Russian invasion, do not want an independent state, and do not want to join Russia. But in any case, I suspect we will never know whether a civil war might break out in the east because I do not think Putin will let it come to that. He will send in the troops well before violence spreads enough to qualify as civil war. What should the West be doing? For now, at least, the West should do everything possible to deter Russia from invading, which in the main means using diplomacy and threats of economic sanctions if Moscow does not deescalate. However, I think it was a mistake for the Obama Administration to be so explicit in taking a “military option” off the table – doing so has encouraged, not discouraged, Russian risk-taking. That is not to say that the West should consider deploying troops to Ukraine. But we should certainly keep open the option of military assistance to Ukraine beyond the MRE’s that have been provided so far, including potentially lethal equipment, if Russia invades and gets into a major shooting war with Ukraine. Beyond that, in my view the most effective deterrent to Russian aggression in the short and medium run is hard power, not economic sanctions. Economic sanctions can do great damage, I suspect, to an already weak Russian economy, but they will take time – probably years – to have a significant impact on Russian geopolitical decision-making. Sanctions can weaken an already soft economy, which in turn will eventually undermine the regime’s public support and constrain military spending activism. But none of that will directly affect the material interests of Putin and his key foreign and security policy advisors – they will still have their access to all the assets of state privilege, as well as the concentrated power of the power vertical. With that in mind, I think that NATO should move, deliberately but rapidly, to improve its defenses along its eastern borders. In particular, we should take steps to increase deterrence in Latvia and Estonia, which means deploying NATO forces there – at least a small force of rotational air and naval assets. If Russia invades, NATO is going to have to forward deploy permanent (non-rotational) forces in Poland and Lithuania, and permanent air and naval forces in Latvia and Estonia, thereby abandoning its earlier stated intention to deploy only token non-host country forces in the east on a rotational basis. That “commitment” was expressed as an intention based on threat assessment, and obviously the threat is now orders-of-magnitude greater than it was. That said, I also think the West needs to offer a pragmatic exit option for Putin that Kyiv, Moscow, and NATO can live with. The only thing that I can think of that fits that bill is an institutionalized solution to Ukraine’s external orientation, one that makes permanent Ukrainian military neutrality but allows it to choose its own external political and economic relations. I am also convinced that the Obama Administration and European Union should use the current crisis as an entry point for discussions with Moscow over a new overarching security structure for the region that prevents similar crises over Ukraine, Georgia, the Baltic states, Belarus, or even Azerbaijan, less likely in the future. My own view is that the security interests of all parties, including Russia, would be served by making all those countries formally neutral, which would create a buffer zone along most of Russia’s eastern borders (the exceptions being a very short border with Norway at the very far north, the borders with Latvia and Lithuania, and the exclave Kaliningrad’s borders with Poland and Lithuania). This could be supplemented with a new CFE treaty on conventional force deployments in the regions bordering the buffer zone. Unfortunately, it may well be that the momentum of events has taken us past the point where this kind of arrangement is possible. And that will certainly be the case if Russia invades. Can economic sanctions deter Moscow from further escalation? I suspect that Western sanctions in general, and in particular financial sanctions, can do great damage to an already vulnerable Russian economy. But the problem is that Putin apparently does not believe that — or if he does, he may not care. The economic relationship between Russia and the West is in fact very asymmetric. Russia’s economy is roughly 1/16 the size of the E.U. and U.S. economies. The E.U. accounts for about half of Russian trade, and that figure goes up if you include the U.S., Ukraine, and other non-E.U. countries in Europe. Russia’s share of U.S. trade is tiny, and its share of E.U. trade is minimal, although that is less true for some countries (e.g., Germany) and certainly some European companies, and a few American ones, have major commitments in Russia. But the E.U. and U.S. account for over 75 percent of foreign direct investment in Russia. There is no way that Russia can replace Western investment and trade by “pivoting to the east,” as many Russian commentators are suggesting, given the distances involved and infrastructure constraints east of the Urals. It is of course true that Europe depends on Russia for much of its energy needs – albeit some countries more than others. Cutting back on gas deliveries – or indeed a financial and economic crisis in Russia – would also hurt the weak economies of the E.U., and to some extent the U.S. and the global economies as well. But Russia needs to sell that energy. The need is somewhat mitigated by Moscow’s very large foreign reserves. But if it ever looked like Russia was really going to shut off gas or oil exports to the West for any period of time, I suspect investors would panic, and capital flight, which is already way up this year, would accelerate. 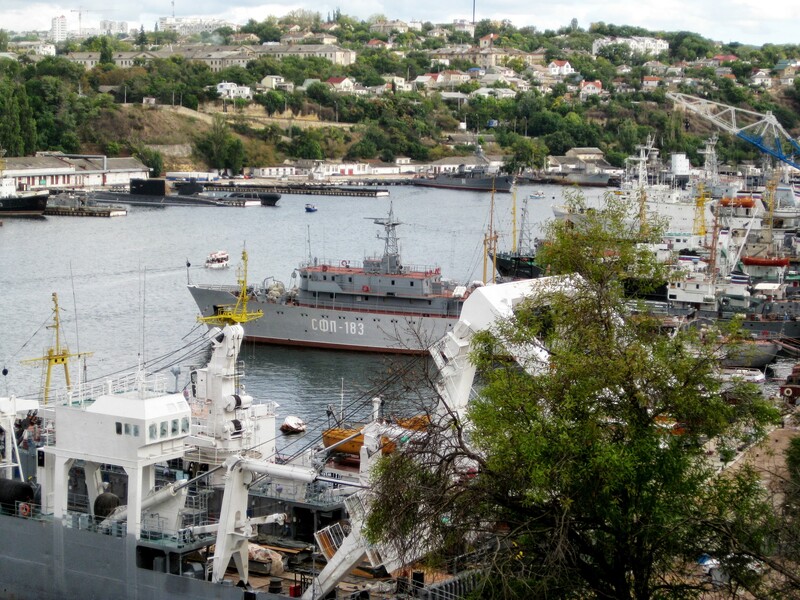 But even if Russia does not invade, I expect a gradual ramping up of sanctions against Russia – for example, sanctions against companies doing business in Crimea. It is going to be very difficult for the West to do business as usual with Russia after the seizure and annexation of Crimea. That said, I am not sure how Putin will react to a steady ratcheting up of sanctions and Russia’s declining economic prospects in the long run. I very much doubt the outcome will be a decision to reach out to the West or liberalize domestically. Do Russia’s energy exports to Ukraine and Western Europe put Moscow in the driver’s seat in the crisis? I suspect that, sooner or later, Ukraine, the West, and Russia are going to find themselves in a very unpleasant game of economic chicken over Ukraine. Western taxpayers are not going to want to see economic assistance to Ukraine used to pay Gazprom for natural gas at rates above those Russia agreed to charge when it signed its Black Sea Fleet basing agreement in 2010 and above rates charged to Russia’s other customers. Nor is Ukraine going to want to repay its debt to Gazprom after the seizure of its state assets, including land, in Crimea. Already Ukraine is moving to sue Russia in international courts, and at some point Ukraine may well inform Moscow that it will repay its debt if and when Russia leaves Crimea and compensates it for the costs of its military intervention and occupation. Before we get there, though, Russia is probably going to begin cutting back on gas deliveries to Ukraine. When that happens, Ukraine may decide to divert Russian gas coming through its pipelines for delivery to the west. Russia may then cease all deliveries to and through Ukraine, which would force Germany to increase Russian imports through the newly built Nord Stream pipeline, which to date has been delivering well less than it is capable of. Depending on when all this shakes out, it may be that reverse flow measures have been taken that allow non-Russian gas that Germany and other countries are importing to be resold to Ukraine. Russia, of course, will not approve of this diversion, and may in turn cut back on its Nord Stream deliveries. How all this ultimately plays out is anyone’s guess. Ukraine’s acting president has said the government is not against holding more referendums. Is that a viable solution to the crisis? Turchynov said he is not opposed to holding a nationwide referendum, which presumably would be on decentralization, federalism, and/or language policy. It would not ask for an affirmation for the Ukrainian state’s territorial integrity. Nor did he suggest that regional referendums on “autonomy,” “sovereignty,” “independence,” or union with Russia would be acceptable. No nationwide referendum could win majority support, in my view, that allowed for secession or annexation to Russia. Under the current circumstances, I much doubt there would be majority support for federalization. In any case, Turchynov cannot offer something like this by himself – at the least, a referendum would have to be approved by parliament and would come after the presidential elections on May 25, which means it would be too late for Moscow or its allies. All of which is to say that a vague statement about a possible national referendum is not going to satisfy Moscow or the pro-Russian militants in the east. And neither have the many statements by Turchynov, Yatsenyuk, and other government leaders about local elections for governors, administrative decentralization, protections for Russian language speakers, and so on. Kyiv has asked for UN peacekeepers to get involved. What do you think of that option? I do not think peacekeepers from the UN, or the observers from the OSCE who are already there, will help much for the same reason the offer of a national referendum is not going to help. They not going to keep Moscow and the separatists in the east from trying to divide Ukraine, weaken the national government, and prevent presidential elections from taking place on May 25. Of course better that they are there than not, because they serve as a useful source of I think objective information about facts on the ground. Will China be able to influence Russia on this? I seriously doubt it. The Kremlin cares much more about how things play out in Ukraine than China does, and China is not likely to take any measures that adversely affect its relations with Russia over Ukraine. What is the likely long-term outcome of the crisis? No matter how things turn out in the short term, I believe we are entering into a long period of geopolitical confrontation with Russia. We will be lucky if we end up in a more-or-less stable Cold War-type standoff. The real danger is a lose lose game of economic and political contestation with unclear rules against a backdrop of potential military conflict.